Old sounds and new works – new sounds and old works – traditional tunes on the dancefloor – full throttle with Swiss-grown music. 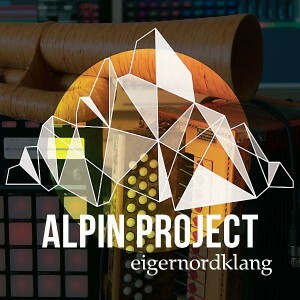 The Alpin Project unites five seasoned Swiss musicians from very different backgrounds with deep-rooted expertise in their own musical styles into one diverse music project: Thomas Aeschbacher (various swiss accordions), Balthasar Streiff (alphorns, büchel, cornet, animal horns), Singoh Nketia alias DJ Flink (sounds, beats), Chris Pfändler (hammered dulcimer) and Barbara Berger (voice). They are rebranding Swiss and and other folk music, bringing together alpine sounds and archaic modernity, turning rural ländlers into “urbänlers” in collective compositions. Ländler, polka, waltz, mazurka … this is music that has always been danced to. In its simplist form, a single schwyzerörgeli is all that is needed. An accordion, hammered dulcimer, violin, clarinet, double bass, Jew’s harp, piano and brass instruments ensure an enormous variety of sound in this folk music.